Italian cuisine is known for its regional diversity. This diversity of course also plays out at Christmas: each of the 20 Italian regions, and often even cities within the same region, have their own traditional dishes. Emilia-Romagna, and Bologna, are no exception. Here’s what you can expect to find on the Christmas lunch menu in Bologna. A platter of regional salumi e formaggi, cold cuts and cheeses, is usually served. Mortadella, of course, and then Parma ham, the prized Culatello di Zibello, Parmigiano Reggiano. It’s not Christmas in Bologna without tortellini. The navel-shaped egg pasta – small circles of rolled dough folded around a filling – are one of the city’s major culinary prides. While the birthplace of the tortellino has long been a point of contention between Bologna and Modena, there is only one official recipe for its filling, which has been registered with the Chamber of Commerce of Bologna in order to safeguard it. A thin layer of pasta and eggs envelops ‘il ripieno’, the filling prepared with pork loin, prosciutto crudo, mortadella di Bologna, Parmigiano Reggiano, eggs and nutmeg (here’s the official recipe). 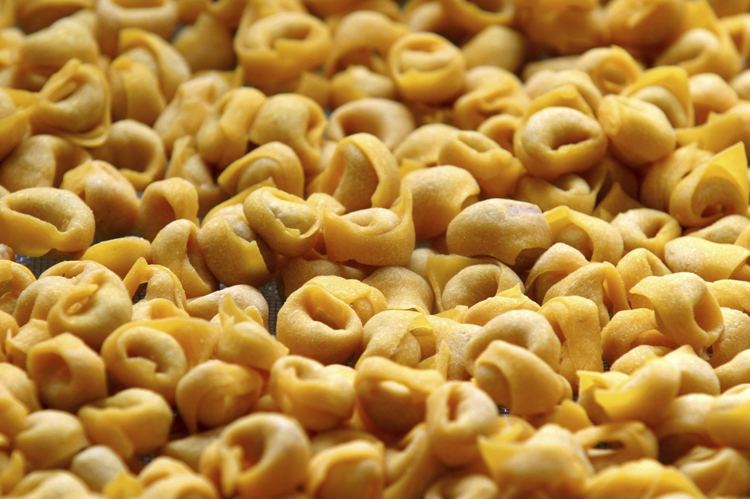 Tortellini should be cooked and eaten in a capon broth – no exceptions allowed! It’s not Christmas in Bologna without tortellini. Here comes the meat feast. The classic second course on the Christmas lunch menu in Bologna features cotechino and zampone. These two pork dishes hail from nearby Modena. Cotechino is made from the noble parts of the pig and the rind. The meats are ground and delicately flavored with spices and herbs, including cloves, pepper, nutmeg, cinnamon and wine, and then stuffed into the intestines. Rather than using the intestines as a casing for the meat, zampone uses the skin of the trotter, zampa in Italian, hence the name, zampone. Cotechino and zampone are served with lentils (lenticchie) and mashed potatoes (purè di patate) – vegetarians rejoice. 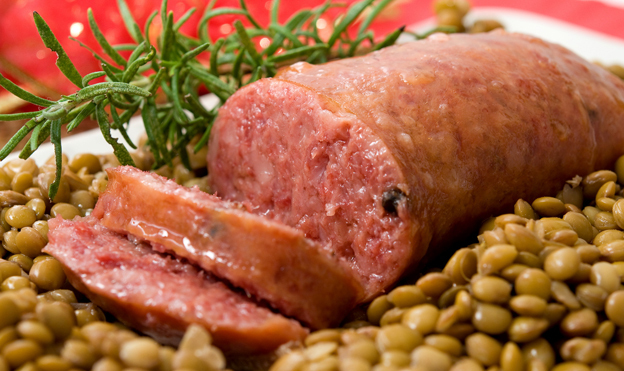 Cotechino with lenticchie, a classic second course of the Christmas meal in Bologna. Some households will also have bollito misto, a stew consisting of various cuts (including the tongue, ew) of beef, veal, cotechino, and a whole hen or capon, gently simmered for two–three hours in an aromatic vegetable broth, made with celery, carrot and onion, cloves, parsley, bay leaf, rosemary and sage. Bollito misto is served with salsa verde, a sauce made with parsley, capers, pickled cucumbers, boiled egg, anchovy fillets, lemon and olive oil. At my house, we do Panettone and Pandoro, the classic Christmas cakes. But the choice for dessert can vary. Originally from Milan, Panettone has a domed shape, with a soft and airy interior beneath a dark exterior. Traditionally, it contains candied orange, citron, and lemon zest, as well as raisins. Pandoro hails from Verona and is the product of the ancient art of bread-making. Sweet breads enriched with eggs, butter and sugar, like Pandoro, were reserved for nobility and were known as “golden bread”, pan d’oro. Pandoro has an eight pointed-star section shape and is often served dusted with icing sugar. Certosino is actually the classic Bolognese Christmas cake. Round, dark, it is made with honey, almonds, pine nuts, dark chocolate, candied fruits (whole pieces), and cinnamon. Just like tortellini, the official recipe for certosino is registered with the Chamber of Commerce of Bologna (you can find great certosino at Atti). 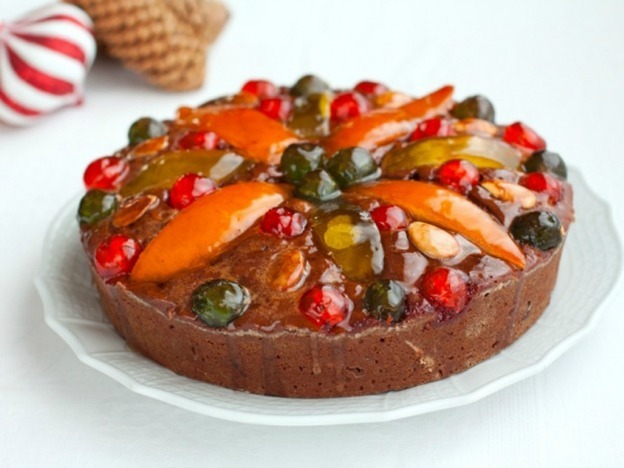 Certosino, the classic Christmas cake from Bologna. Similar to certosino is panone, a baked ‘bread’, filled with cocoa, candied fruits, chocolate chunks, raisins, jam, made into square or rectangular loaves. The Christmas meal in Bologna will be best enjoyed with a local wine, like Pignoletto dei Colli Bolognesi for white, and Lambrusco for red. Buon appetito & Buon Natale! Il solo leggere di tutte le leccornie descritte nell’articolo stimola la secrezione gastrica…. Allora sei già pronto per il pranzo di Natale! !